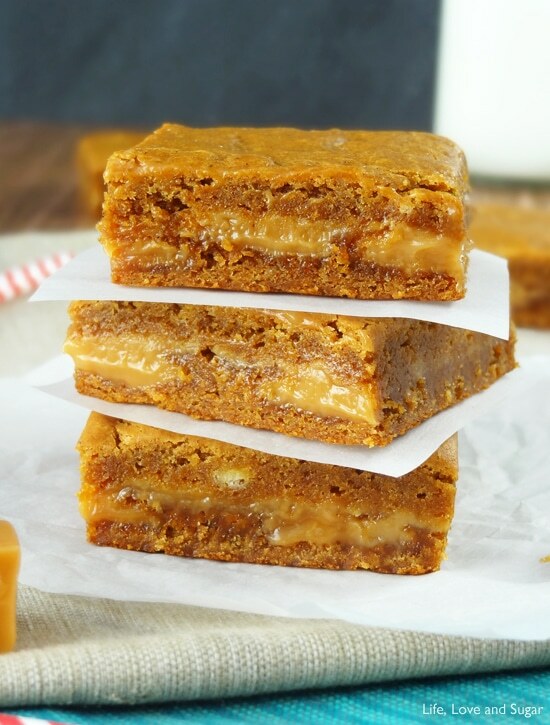 These Gingerbread Caramel Gooey Bars might just be my favorite bars to date. They are so chewy and flavorful, it’s hard to stop eating them. And with all the brown sugar, molasses and sweetened condensed milk in them they stay soft for no less than a week. Even though they won’t last this long, I think they’d even be soft after two weeks. That’s legit, my friends. My inspiration for these bars came from one of my favorite bloggers – Dorothy, from Crazy for Crust. 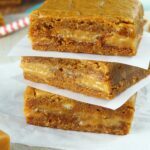 When I saw her Pumpkin Toffee Gooey Bars I almost fell out of my chair. I knew I had to make a version myself and gingerbread seemed like the perfect way to go. I mean how do you make something gooey and delicious even gooier? Add molasses and caramels. Chewy city. You start out with a yellow cake mix. Nice and easy. It quickly gets sticky with 3/4 a cup of molasses. After adding the molasses, dark brown sugar and spices, the delicious smell will have you wanting to eat the batter. In the first round of these bars, I used caramel bits. I normally use the square caramels and cut them into pieces, but in the interest of saving time I gave the bits a shot. The bits just didn’t quite do it. They are meant to hold their shape, like a chocolate chip, but I wanted gooey and melty. And you just couldn’t really taste them amongst the star power of the molasses and ginger. So for round 2, I went back to my beloved square caramels. I melted them down most of the way, leaving some chunkiness, and added the melted caramels right into the sweetened condense milk. Once combined, it all looked like delicious caramel. When sandwiched between the gingerbread dough and baked, the caramel-y chunks were just as melty and gooey as I’d wanted. Perfect! The caramel totally compliments the gingerbread. 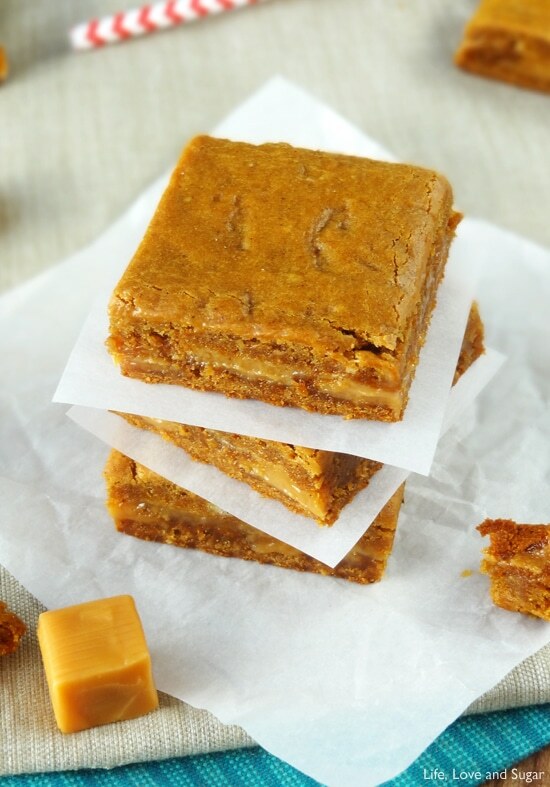 I had these bars for breakfast for about a week straight – they go perfect with my pumpkin coffee. 😉 Then I decided I needed to try and save the rest for my mom, who is a big gingerbread fan. Saving them was not an easy task. I wasn’t entirely sure if they’d stay soft, but after almost a week and a half they were still so moist and chewy. These bars would be perfect for sending in a care package to someone. My mom fell in love at first bite. She tried to hide them from my dad. Remember the cavernous caves of the pantry I told you about before? She considered using those for hiding, but was afraid she’d forget about them (it recently happened with something else). But then later, while eating one, she had a weak moment and gave my dad a bite. His sweet tooth is as bad as mine. After that, she didn’t get another bar. He devoured them all. They were anxiously awaiting this recipe, so naturally it’s the first thing I’m sharing after Thanksgiving. Speaking of Thanksgiving, I hope everyone had a wonderful holiday! I know I did. It was so nice to get away for a few days and relax with friends and family. We were able to get together with some friends we hadn’t seem in a while, so that was really nice. 1. Combine cake mix, egg, molasses, butter, sugar, flour and spices and mix until smooth. Batter will be thick and sticky. 2. Melt caramels in a microwaveable bowl until mostly smooth, with a few chunks left. 3. Add melted caramel to sweetened condensed milk and combine. 4. Line a 9×9 pan with parchment paper, extending the paper up the sides of the pan. 5. Add half of the gingerbread batter to the pan and spread evenly. Batter will be sticky, so it might help to drop spoonfuls into the pan, then spread. 6. Pour caramel mixture over the gingerbread dough in the pan. 7. Drop spoonfuls of remaining dough over the caramel layer, spreading a bit to mostly cover the caramel layer. 8. Bake at 350 for 30-33 minutes. 9. 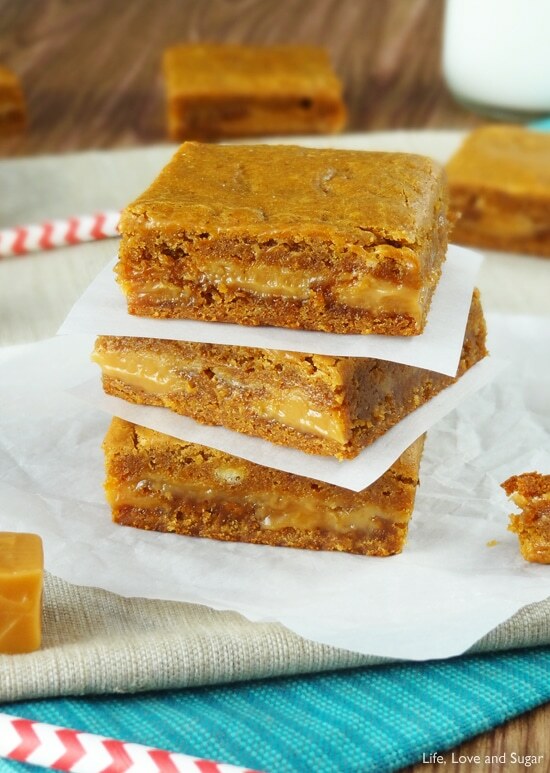 Allow to cool completely in the pan so that the caramel has a chance to firm up (you could also refrigerate it, but the caramel may become hard to cut), then cut into squares. Bars should be good if stored in an airtight container for 7-10 days. This post linked to Six Sisters’ Stuff, Inside BruCrew Life, Tidy Mom, Chef in Training, Wine and Glue, This Gal Cooks, Skip To My Lou, What’s Cooking Love?, Kleinworth & Co, Buns In My Oven, I Should Be Mopping The Floor, 30 Handmade Days, Living Well Spending Less, Love Bakes Good Cakes, Lady Behind The Curtain, Pint Sized Baker, Keeping It Simple Crafts, Gingersnap Crafts, Crumbs and Chaos, Flour Me With Love, Say Not Sweet Anne, Simply Sweet Home, A Glimpse Inside, The Mandatory Mooch, Lamberts Lately, Shaken Together, The Bitter Side of Sweet, Simple Living and Eating, Walking on Sunshine, Ashley’s Dandelion Wishes, Mandy’s Recipe Box and Table for Seven. OMG. YES YES YES. These are fab! I am addicted to gingerbread right now. LOVE these! Lindsay these amazing. I’m sure they wouldn’t last long in my house. I love gooey butter anything especially growing up in St Louis, home of the Gooey Butter Cake. Nice creation and definitely gooey! The words “gooey” and “caramel” had me sold. These look so good, and I can just imagine how quickly they would be devoured by my housemates. Pinning! OMG these look amazing. I am loving your blog and now that you’ve gotten my cookies, I can finally comment! 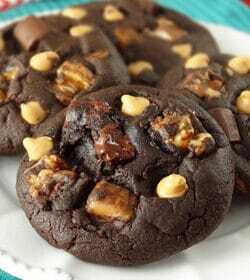 These are on my to-bake list for sure. Thanks so much Sara! Glad we got connected through the cookie swap. 🙂 The cookies are yummy – thank you! These wouldn’t last more than five minutes in my house! Between my parents, my sisters, and I we’d devour them immediately! The problem in my house is that hiding sweets is so common that we all know where to look to find them! Are you even kidding me right now? I’m in love with these bars. Anything “gooey” and I’m ALL IN! These look amazing! I love gooey caramel. I’m stopping by from Create It Thursday. 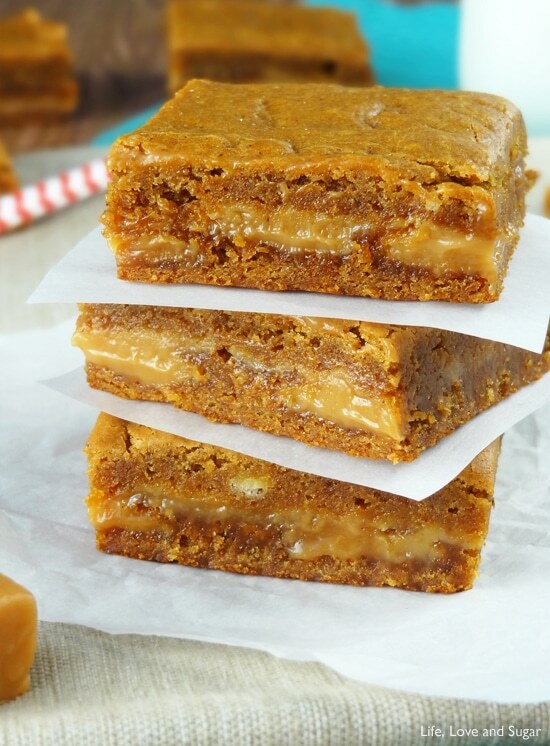 That caramel layer in the middle looks amazing! thanks so much for linking this to Less Laundry, More Linking party! Thanks Nancy! 🙂 Thanks for the party! These bars are incredible Lindsay! Caramel and ginger together? Heaven! Pinned and just shared on Facebook! Thanks Trish! 🙂 Thanks for sharing too! These sound amazingly good! Perfect for the holidays. Wow, Lindsay, I these bars define “chewy gingerbread”! I love the combination of flavors. You know I am always on the look-out for good care package recipes. 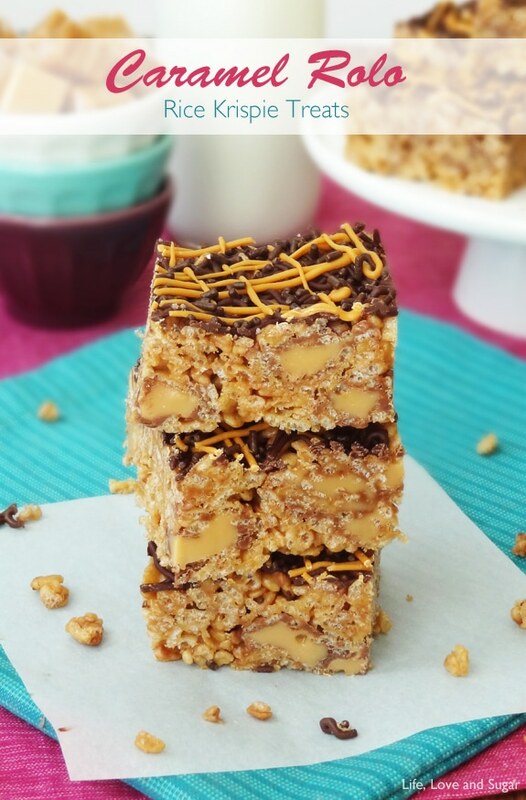 The stays chewy and delicious factor makes these bars a winner! Pinning for myself and also posting a link on the Soldiers Angels Bakers fb page. Packages to the military take forever to arrive! 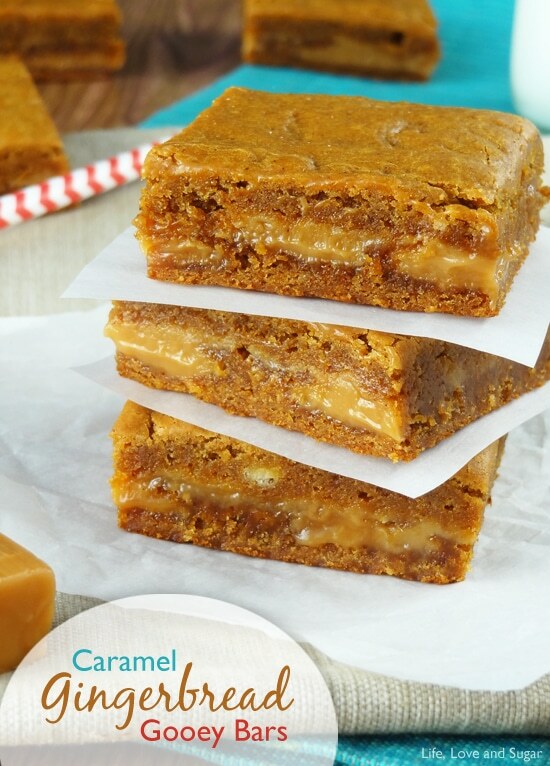 Amazing with the caramel goo in the middle… wow. Thanks for sharing on foodie friday. 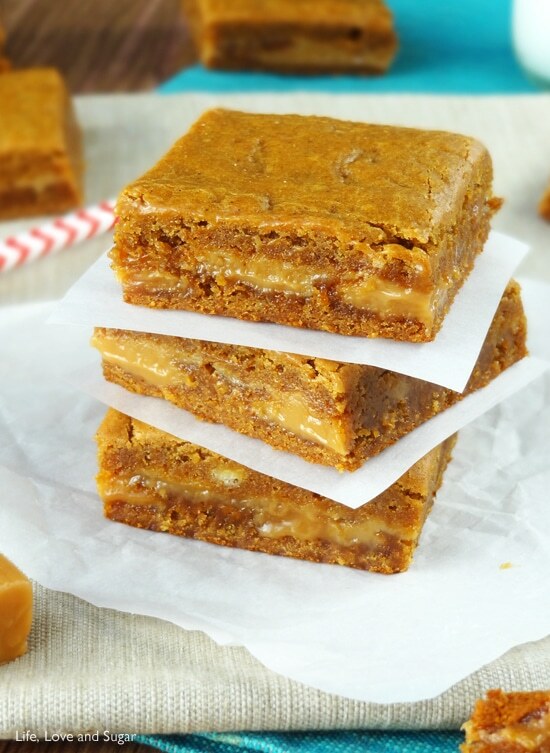 I just made these and used an 8oz jar of Dulce de Leche instead of caramels because I’m too lazy to unwrap them! They tasted amazing! Thanks for such an awesome recipe – will be one of my Christmas faves from here on in! Holy moley! YES!!!! Those look so insanely delicious! Love all that caramel in there! Oh yea, these wouldn’t last a week in my house! They look great, Lindsay! Pinned! I love molasses and I love how these bars look soft and gooey, just what I want for the holidays! They are definitely soft and gooey! Thanks Kari! i love ooey gooey bars! yum! I’m in the UK and not sure what the ‘yellow cake mix’ is, is it the Betty Crocker packet mix I’ve just found on Google? Does it produce a light sponge or a heavy cake? I’d rather bake from scratch so trying to figure out what cake recipe I could use to do this Gingerbread and caramel recipe justice! Hi Jenny! Yes, I’m guessing it probably is like the Betty Crocker mix you’ve found. 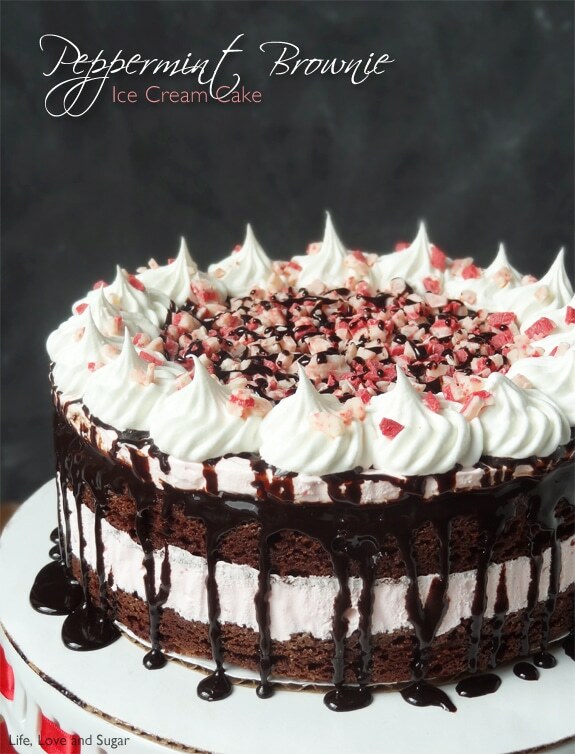 It’s a pretty standard cake – not spongy. The mixes just come with all the dry ingredients premixed. It’s usually about 2 1/2 cups worth of mix, I just don’t know the breakdown of the ingredients. Has anyone made these using a gluten free cake mix? How did they turn out? I made these with a spice cake mix and put everything except the additional spices. The smell of them baking is reason enough to make these! This is a wonderful treat for gingerbread lovers! Thanks for another home run! I am going to be making these for all the family this year to go in their christmas packages!!! I think they are all going to love these! Hi Jessica, thanks for sharing your concern. This is a good bit older recipe. If you look at some of my newer recipes, I think you’ll find that is less the case. Are there not store-bought pie crusts to use in place of the American brands? I would’ve thought so, but I honestly don’t know. For Cool Whip, a stabilized homemade whipped cream can usually be substituted. I’ve got a how to on that here. I don’t have a substitute for some of the chips and candies, since I’m not familiar with what’s available elsewhere. 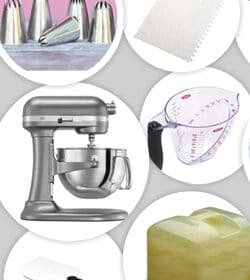 As for this recipe, it might be harder to suggest an alternative (I’m assuming the cake mix, caramels and maybe even sweetened condense milk are all issues?) but I did post some gingerbread cookies this morning that could be a nice alternative. Same here. Baked the full 33 minutes. Cooled for an hour. Tried to cut and totally mush. Returned to oven for another 55 minutes (already ruined, so why not?). Cooled another hour. Still total mush. Not just gooey, but absolute mush that would require a spoon to eat. And yes, my oven is calibrated correctly. Looking back at the recipe, I can see it doesn’t specify the cooling time, which I have fixed. When warm, caramel is gooey. You need to let these cool completely to room temperature so that the caramel can firm up before cutting. Otherwise, yes, they’ll be gooey. I just made these last night for a large group of people (I multiplied the recipe by 3) and everyone loved them. So far every single recipe I’ve made from your blog (5 in total as of today) has been a complete hit! Thanks so much. Awesome! So glad to hear you’ve enjoyed everything! Thanks Samantha!